Fashion capital of the country, New Delhi witnessed the first 'Carrera Night' on Wednesday, September 11th , it marked a new beginning for Carrera, Safilo Group’s historic and iconic eyewear brand. I couldn't make it to the event, but I have got few pics and more about the ninght.. Take a look! Carrera partnered with MTV, delivered a fashionably amazing party which was true to the Carrera’s brand DNA which dazzled the audience. Fashion's eminemt, top industry executives, society influencers, Carrera fans and media friends alike enjoyed Carrera’s unique “You race or you don’t” brand experience. Special appearance by MTV's most Stylish icon Rannvijay Singh, spiced up the night with his effortless sty;e statement , daring lifestyle and racing attitude. Live music performances also included a great show from Advaita and special vibes of Aqua DJ set rocked the night. MTV VJ Gaelyn Mendonca was a great host for the party. The Aqua Lounge at Park Hotel was the perfect location to host the event: India's first boutique hotel, with its blend of sophistication and international style, was a great stage to showcase the brand’s philosophy and direction. Carrera’s 2013 eyewear collection displays, influenced by the brand’s new identity, unveiled its re-branding through integrating its four iconic chic philosophies: Icons, Muses, Craze and Active. Each concept portrays its own personalities to maintain a common theme: unmistakable, original design combined with a sophisticated urban Style. SPOTTED: Bollywood Fashionistas, Sonam Kapoor and Anushka Sharma wearing designer Nikhil Thampi's creation in their latest brand commercials. In no time this young designer has made his mark in the fashion industry with his signature cuts, use of bold colors like black and gold, figure-flattering silhouettes and contemporary designs. Seems like, he is the best go to designer when it comes to styling such glamourous commercials, which we can certainly see in the below pictures; Body flattering, simple yet bold designs seem to work well with these Bollywood Divas not just in these commercials, but for the Magazine Covers, editorials and appearances. Soon this young house of talent has found admirers and followers among Bollywood's several leading ladies and socialites, who are frequently seen in his creations and at the various shows of the designer. This young designer sure has a bright future in the fashion industry and with each passing season he has proven himself. We wish all the best to this talented Gen Next Designer, he is definitely here to stay..!! 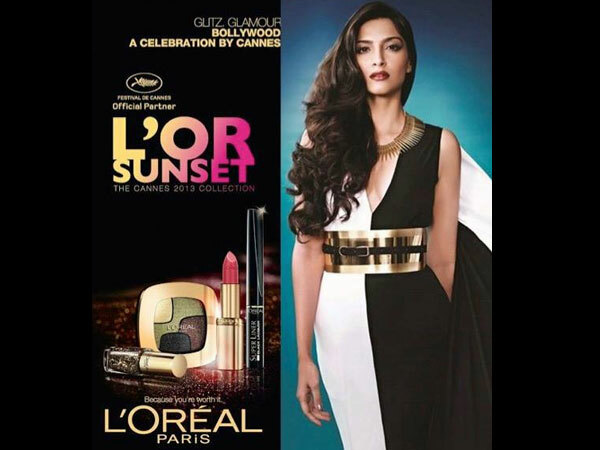 Sonam Kapoor in a signature Nikhil Thampi Creation for L'oreal Paris mercurial. Virat Kohli and Anushka Sharma in the Clinic All Clear Commercial; Anushka Sharma wearing a Nikhil Thampi Creation.